I was born in the radio age and television sends me to sleep most of the time. I dont think video killed the radio star, in fact, as far as I am concerned it released the star that is radio. Radio maybe hasnt properly realised this fact yet, but there are some places to go to hear what I mean. Australia for instance, where radio has played a perhaps unprecedented part in survival and communication, makes creative radio on many levels. Internet radio and real time audio on the web is making many new and exciting things possible (although I sometimes miss the crackle and hiss) and I am very comfortable working in this new old creative environment. BEACH CROSSINGS – PACIFIC FOOTPRINTS – (1 hour) The genesis of this piece was Pino Saulo asking me to do a piece for the RAI in Rome. I suggested swinging something around the Bob Dylan song Masters Of War. He told me it was one of his favorite songs and liked the idea even more when i suggested trying to do it like Albert Ayler might have approached it. The subject was the Pacific Ocean Nations 60 years after World War 2. which would start with the first Europeans arriving in Tahiti and end in the 20th century with the dropping of the atomic bomb on Hiroshima. Text that was to be linked by music, improvised by small groups of musicians following a graphic score and conduction indications from me and several songs, including Masters Of War. Recorded 31st May 2005 at Rai Studios in Rome/Italy produced by Pino Saulo. The entire piece was eventually released as a c.d. on RAI Trade Records in 2007. TROUBLE WITH TROUSERS – ( 50mins.) – with Elio Martusciello and Jean Marc Montera. A radio project in seven parts, for three musicians playing guitars and electronics, improvised and broadcast as played, for the RAI 3 Audiobox program on September 30th 1997. Also broadcast on Resonance FM – London in 1998. ABUSE OF TRUST – ( 43mins.) A solo radio project, made in two parts, commissioned by the RAI 3 (Italian Radio) Audiobox programme and broadcast 24th August ( my birthday )1996. 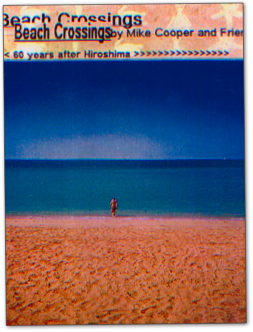 Made in response to re – commenced nuclear testing in the Pacific Ocean by the French Government. Also broadcast on Resonance FM – London in 1998.